For its first ski hill, the club chose a spot in Hunters Park behind Washburn School on St. Andrews Street. Dubbed Duluth Hill, the site promised an approach of three hundred feet with a minimum jump of one hundred feet. Mangseth and four others tested the hill on December 18, 1905, with the captain jumping seventy-five feet. 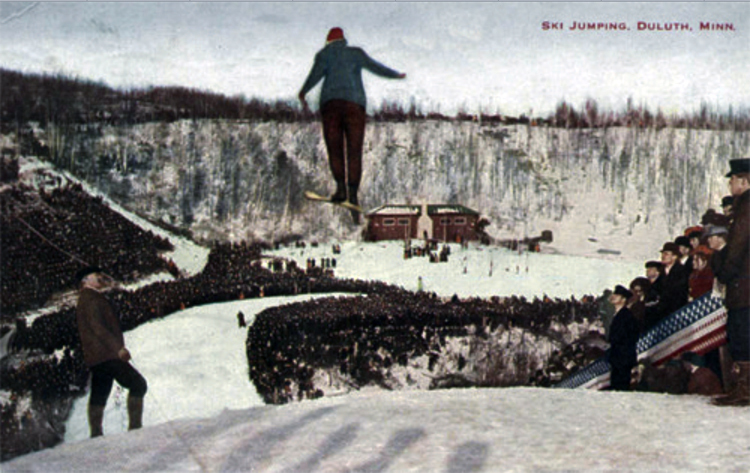 The Ski Club held its first event there on January 7, 1906, and a crowd of three hundred onlookers saw at least one jumper soar ninety-six feet. Later that month the Duluth Ski Club captured several awards at the first annual ski tournament on White River Hill in Ashland, Wisconsin, with assistant captain Olaf Larson tying for first place and Mangseth coming in third. Two other Duluthians finished in the top ten. The Duluth Ski Club continued to dominate that year. At the National Ski Tournament on Brasswire Hill in Ishpeming, Michigan, in February, Duluth’s Ole Feiring took the $100 first prize and Mangseth came in second. Later that winter on the Aurora Club’s hill in Red Wing, Minnesota, Duluth’s Gustave Bye jumped 106 feet, a new American record. The following season the club abandoned its Hunters Park hill when it purchased land adjacent to Chester Creek above the parkway and built a ski jump called Chester Creek Hill, which unofficially opened on Christmas Day 1906. The new hill’s first tournament was held on January 20, 1907, with Feiring jumping 112 feet, shattering Bye’s record before a crowd of 3,500. Feiring’s new American record was still twenty-seven feet shorter than Norway’s best. On their new home hill, the Duluth men took first through fourth place. Feiring’s record was short-lived. Four days later in Red Wing, Aurora Club member Ole Mangseth—John Mangseth’s brother—jumped 114 feet. Despite this setback, Feiring went on to dominate tournaments for the rest of the season, with several first-place finishes. A February tournament at Chester Creek Hill drew an estimated crowd of 5,000. The following year, after building a warming house for spectators and a club house for members, the Duluth Ski Club hosted the Fourth Annual National Ski Tournament of America. By nine in the morning on the first day more than 9,000 spectators had surrounded the hill. Feiring, who was greeted by “deafening applause,” fell twice, putting him out of the running. Duluth’s John Evenson came through for the Zenith City, setting a new national record at 116 feet. Four days later, during a special extension of the tournament, John Mangseth broke Evenson’s record when he jumped 117 feet. Later that same month in a tournament in Ishpeming, Evanson landed a 132-foot jump, closing in on the world record. Duluth had become the center of ski jumping in the United States. 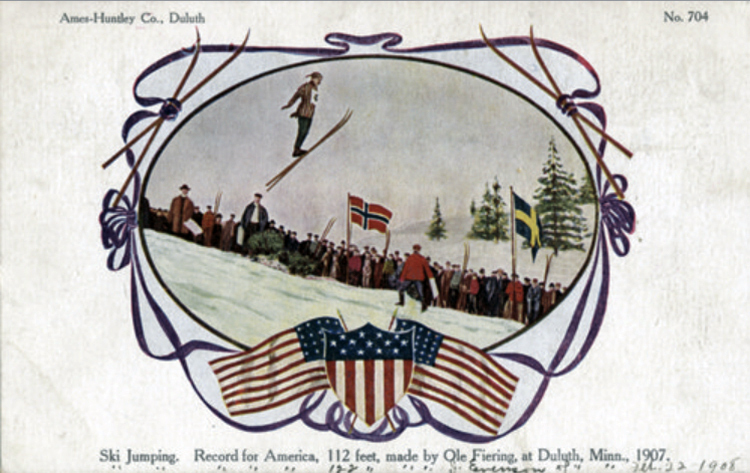 Still, the Duluth Ski Club had no monopoly on ski jumping in Duluth. The West End Ski Club organized in 1907 with boys from the Mork Athletic Club and Hill Toppers Club coming together to host tournaments on a hill adjacent to Piedmont Avenue. That same year the West Duluth Ski Club organized jumping from a hill located along today’s Skyline Parkway between Fifty-ninth and Sixtieth Avenues West. In 1931 the city built a ski jump in Lincoln Park, most utilized by the Zenith Ski Club. National focus remained on the Chester hill and the Duluth Ski Club. In February 1908 the club hosted the Fourth Annual National Ski Tournament of America at the Chester Creek Hill. That April the slide and its scaffolding came tumbling to the ground after a wind storm. It was rebuilt, and at eighty-one feet tall the new jump stood twenty-five feet higher than its predecessor. 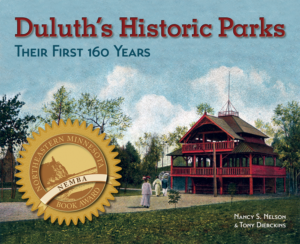 The Duluth Ski Club continued to play a large role in the National Ski Association for the next nine years, hosting the national tournament again in 1915. By then Duluth skiers had ceased to dominate the winner’s platform. When the club raised the jump to ninety feet before the tournament, it appealed in local newspapers for new members—their dues were needed to finance the construction. In the fall of 1915, the club was in desperate need of money. The following May the entire jump came down in another wind storm, “tossed a hundred feet into the woods and shattered to bits,” the News Tribune reported. The grandstand tipped over; the slide approach was blown halfway down the hill. The club folded shortly thereafter. In 1918 the city began negotiations to purchase the Chester Creek Hill. After two promising years of unorganized jumping at the Miller Creek hills—including a tournament each year—former members and new enthusiasts were encouraged to reorganize in 1922. The following year, the Duluthians donned the club’s green-and-white uniforms for the first time, sending eight skiers to the national tournament in Minneapolis. Over the years, several Olympic ski jumpers trained at Chester Park as members of the Duluth Ski Club, including Adrian Watt, Greg Swor, and Jim J. Denney. During trials for the 1968 Olympics, Watt landed a jump of 337 feet, setting a record at Pine Mountain in Iron Mountain, Michigan. He competed in the 1968 Olympics and the following year won the U.S. Championship. A member of the U.S. Ski Team from 1970 to 1975, Swor was U.S. junior champion in 1970 and U.S. Champion in 1972. Denny captured the U.S. ski jumping championship in 1976 and 1980 and the 1978 World Cup. He was inducted into the American Ski Jumping Hall of Fame in 2008. Chester Bowl saw its last ski jumping competition in 2005, and the Duluth Ski Club has not been active since then. (It technically still exists as a legal entity called Duluth Nordic Ski Club, Inc., owned by former club member George Hovland.) In August 2014 workers pulled down what remained of Chester Park’s historic ski jumps.